Spirit. In the atmosphere of worship, prayer, and revelation there is restoration. This is a place of new beginnings. Divine impartation happens as gifted teachers proclaim the truth of God’s Word. Freedom and fire have been imparted into the lives of our graduates. Preparation for God’s purpose is the heartbeat of AIUC&TS. Each man and woman has been put into the earth with a holy purpose. As preparation meets opportunity, miracles will happen." Opportunity is priceless, challenging, and stimulating. For those who pass it by, there is a void. For those who grasp it, the accomplishments and memories have lifelong significance. The decision to attend Achievers International University College and Theological Seminary is a step into an oasis of opportunity. Distinct in its blend of tradition and innovation, AIUC&TS is building the lives of its students to impact the world for Christ through the various professions, ministries, and businesses to which He has called them. Dedicated caring faculty, and a warm friendly student body from all over Valencia and the nation are all key ingredients in this unique opportunity. We offer this most affordable, once-in-a-lifetime experience to you. I invite you to become a part of our school's growing Family. AIUCTS believes that wisdom, knowledge, and understanding come through the Word of God. We believe that there is a time of calling, a time of preparation, and a time of sending; and we believe that a person's preparation for ministry will determine his ability to serve effectively in his calling. AIUCTS is a nondenominational educational biblical theological institution committed to educating and training Christian men and women to serve with excellence in their field of Christian service, such as: pastors, evangelists, teachers, ministers, elders, missionaries, organizational leaders, biblical educators, biblical counselors, administrators, managers, and other Christian workers and all born-again believers. AIUCTS is a distance learning university, and all programs are completed through home study. In order to carry on an effective 21st Christian ministry one must be fully trained and equipped for service. AIUCTS programs will take you steadfastly through the Holy Scriptures and other biblical, theological and ministerial subjects essential for ministry. At AIUCTS you will be fully developed for effective full-time Christian ministry; you will be fully trained and equipped, whatever your area of service may be. Congratulations on taking the first step to earning your degree, and thank you for considering AIUCTS. Don’t delay, start on your way today to earning your associate's, bachelor's, master's or doctoral degree. We would love to have you as part of our student body, and may the Lord bless and direct you as you prepare for undergraduate, graduate or postgraduate study. If you have any question, don't hesitate to contact us by phone or email, we would be more than happy to assist you in any way possible. Thank you and maranatha! The Seminary is running a full-time, part-time, extension and correspondence Theological/Biblical courses for those who have the call of God. It is necessary that every minister prior to taking up the challenges of answering God's call must fulfil the initial basic requirements of under going a period of training whether full-time or by correspondence. Pastoral Training is the dynamic life giving element in every Church organisation. Having pastors is not enough but there must be a ready and continuous supply of potentials to meet the future and some times unexpected pastoral needs to fill the inevitable gaps in our churches. An untrained Pastor is as dangerous as an untrained Medical Officer. Consequently, Pastoral Training must be geared towards increasing the self awareness of the Pastors and thereby, improving his skill, knowledge and capabilities through a long and planned system of work experience as well as formal and informal education and training. 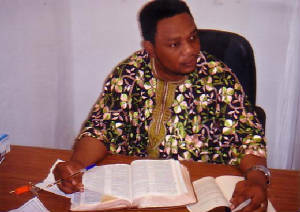 It includes all situational changes to which the pastor may be exposed in the course of this working career which are calculated to stimulate his thinking and improve his attitude to his work, the ultimate purpose being to bring about improvement in his effectiveness and contribution to the achievement of the objectives of his organisation. It is with these thoughts in mind that the seminary has been established to produce ministers who could rightly divide the word of truth in their respective churches. If your desire is to honour Christ while preaching and teaching the Bible as the inspired Word of God, Christian Faith is the School for you. The Bible centered curriculum and specialized programmes are designed to prepare you to meet the challenges which you will encounter daily in your ministry.